2011 is the 25th anniversary of the Survivor Series. I had originally planned to re-watch the previous 24 Survivor Series shows and do a write up of random thoughts about the shows. Then I remembered there was something bigger than the 25th Survivor Series pay per view. November 13th is the first Chikara Internet pay per view, High Noon. Based on the cards announced so far, I am much more excited for Chikara’s show than the WWE show. But then, I’m also a bigger fan of Chikara than WWE. So instead of doing 24 days of Survivor Series promotion, I’m going to do 13 days of Chikara promotion. 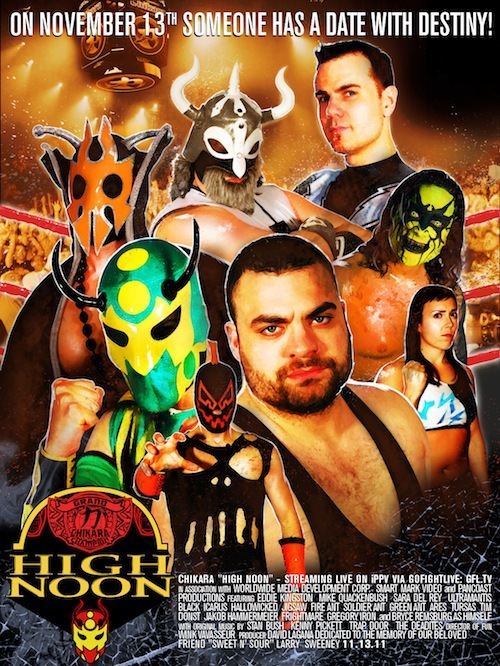 Each day I’m going to highlight a different aspect of Chikara in an attempt to persuade you, loyal reader, that High Noon is a show you must see. In addition to my thoughts, I’m trying to line up some 10 Questions with members of the Chikara roster so they can tell you why you should watch the show. The first stop on the High Noon promotional train is a look at the card as it stands as of this writing (October 30). GREGORY IRONS vs. ICARUS: Icarus is Chikara’s one full-fledged heel. I have yet to see any crowd who actually gives Icarus any love despite the fact Icarus has been on the roster since the beginning. Icarus is a wrestler fans love to hate. Icarus is part of the Trios team of F.I.S.T. with partners Chuck Taylor and Johnny Gargano. Gregory Iron is probably the only professional wrestler who suffers from Cerebral Palsy. Gregory made the news back in July when CM Punk, fresh off winning the WWE title, showed up at an AAW show Irons was wrestling on and verbally put over the young competitor. This match is the third meeting between the two. Icarus won the first meeting while Irons won the return match. Now it comes down to the rubber match to see who wins bragging rights. COLT CABANA vs. ARCHIBALD PECK: This is a rematch from King of Trios. Archibald Peck is my vote for wrestler of the century, or at least the year. GREEN ANT vs. TURSAS: Another rematch, this one from the Chikarasurus Rex weekend. The build up to their first match was classic as Chikara borrowed from the Lex Lugar/Yokozuna feud by having Green Ant travel across the country on the Flex Express on his way to the big match up. Tursas is the biggest member of the Chikara roster, and won the first match against Green Ant. In a recent Chikara update video, Green Ant showed a lack of confidence in his ability to beat Tursas. It’ll be interesting to see how this match plays out. THE SPECTRAL ENVOY (Ultramantis Black, Hallowicked) vs. BDK (Ares, Tim Donst): Another example of long term booking, this match has been building for two years. The story started when Ultramantis started using the Eye of Tyr, which was later to be revealed he had stolen from Ares. Ares and Tursas showed up at the last show of the 2009 season and formed the BDK. The BDK dominated Chikara for most of 2010 while 2011 has seen the foundation of the group start to crumble. This is a no disqualification match and I would not be surprised to see the BDK completely fall apart should Ares and Tim Donst not manage to win the match. THE FUTURE OF THE OSIRIAN PORTAL: Earlier this year Amasis, the leader of the Osirian Portal was injured in a car wreck. Since then he has been out of action of Ophidian and Hieracon have continued wrestling with various degrees of success. At High Noon, Amasis will make an announcement regarding the future of the Portal. One of the reasons I like Chikara so much is because the behind the scenes events are rarely covered by the wrestling news sites. I have no idea how serious Amasis’ injuries were or if they were truly career threatening. Part of me thinks if Chikara is giving Amasis time to address the crowd then most likely he will announce his return and the Portal will continue. At the same time, given the popularity of the Portal, I could see Chikara giving Amasis a chance to address the fans for a farewell speech to thank them for supporting him over the past few years. Whichever way the announcement plays out, I’m curious to hear what Amasis has to say. MIKE QUACKENBUSH vs. EDDIE KINGSTON: The finals of the 12 Large Summit to crown the first ever Chikara Champion comes down two of Chikara’s most popular competitors. While I’m a bit disappointed Quack made it to the finals (nothing against Quack, it’s just that since he’s the owner of Chikara, I put this in the same category as when Triple H is booked to be the focus of WWE or when Jeff Jarrett was constantly champion in TNA), I also think this is the best match up to end the tournament. The tournament was named the 12 Large Summit in memory of former Chikara wrestler “Sweet and Sour” Larry Sweeney who passed away in April 2011. Both Mike and Eddie have storied history with Sweeney and I can see this match being as much of a tribute to “Sweet and Sour” as it is a match to crown a champion. In addition, this should be a solid main event and am curious to see the outcome and what it will mean for Chikara as they prepare for Season 11. So far this is a really good line up for Chikara’s first Ippv. I expect another 2 or 3 matches to be announced over the next week based on the fallout of “Maiden Flight of the Great Condor” show. I cannot stress enough how much you should order this show if you’re a wrestling fan. It’s only $15 and can be ordered by clicking this link. If you’re still not convinced you should order the show, hopefully over the next 12 days I will be able to change your mind. For more on Chikara check out their website, and keep up to date with their official YouTube channel. And of course, follow My123Cents on Facebook, Twitter, and YouTube. If you don’t think you should buy this show, I want to hear your reasoning and point out the flaws in your thinking.